The Heikin-Ashi Close is simply an average of the open,high, low and close for the current period. The Heikin-Ashi Open is the average of the prior Heikin-Ashicandlestick open plus the close of the prior Heikin-Ashi candlestick. The Heikin-Ashi High is the maximum of three data points:the current period's high, the current Heikin-Ashi candlestick open or the current Heikin-Ashi candlestick close. The Heikin-Ashi low is the minimum of three data points:the current period's low, the current Heikin-Ashi candlestick open or the current Heikin-Ashi candlestick close. 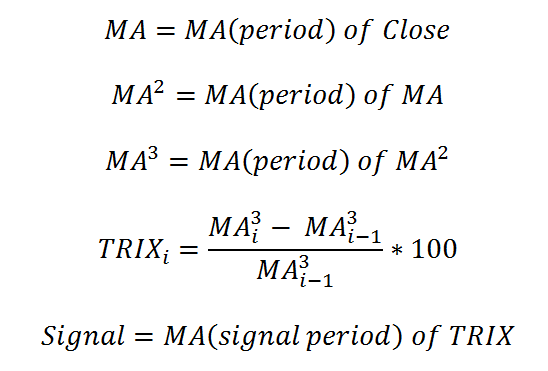 You can see how EMA (Exponential Moving Average) and ATR (Average True Range) indicators are calculated in corresponding sections of this article. Totals of the money flow amounts over the given N days are then formed. Positive money flow is the total for those days where the typical price is higher than the previous day's typical price, and negative money flow where below. If typical price is unchanged then that day is discarded. Parabolic SAR is created according to the following algorithm. Where SARi and SARi - 1 represent today's and tomorrow's SAR values, respectively. The extreme point, EP, is a record kept during each trend that represents the highest value reached by the price during the current up trend - or lowest value during a downtrend. On each period, if a new maximum (or minimum) is observed, the EP is updated with that value. The α value represents the acceleration factor. Usually, this is set to a value of 0.02 initially. This factor is increased by 0.02 each time a new EP is recorded. To keep it from getting too large, a maximum value for the acceleration factor is normally set at 0.20, so that it never goes beyond that. If tomorrow's SAR value lies within (or beyond) today's or yesterday's price range, the SAR must be set to the closest price bound. For example, if in an up trend, the new SAR value is calculated and it results to be greater than today's or yesterday's lowest price, the SAR must be set equal to that lower boundary. If tomorrow's SAR value lies within (or beyond) tomorrow's price range, a new trend direction is then signaled, and the SAR must "switch sides." Upon a trend switch, several things happen. The first SAR value for this new trend is set to the last EP recorded on the previous trend. The EP is then reset accordingly to this period's maximum. The acceleration factor is reset to its initial value. Volume + Moving Average does no calculations with Volume and adds moving average of either SMA or EMA type calculated from Volume series.